The bush poppy (Dendromecon rigida) really is a poppy (Family Papaveraceae), it just doesn’t look like the poppies we are accustomed to seeing. And, strictly speaking, it’s supposed to bloom from February to May or June. But the bush poppy (also called a tree poppy) at the Granada Native Garden doesn’t know that — it seems to be in bloom all year round, more or less. More during its assigned blooming season. 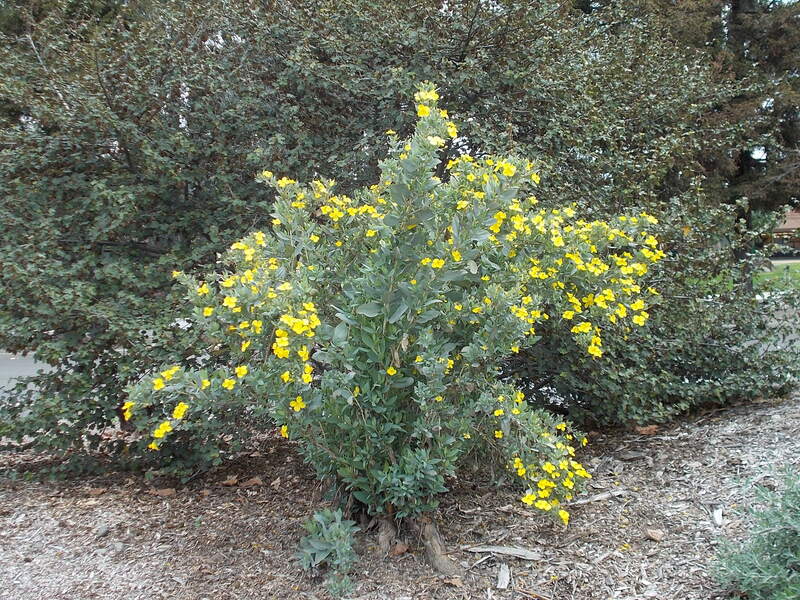 The bush poppy is one of those plants at the Granada Native Garden that never receives any water (once it is firmly established) outside of the rainy season — no summer water. 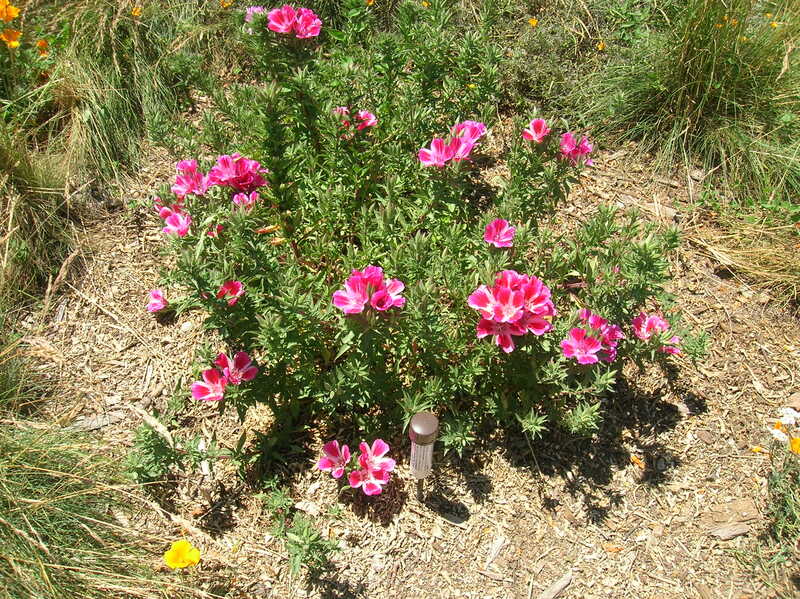 It grows well in both sun or shade, but seems to prefer sunny locations (which match its brilliantly sunny blossoms! ), as long as the drainage is very good. The only care we give it in exchange for its colorful addition to the Garden is to remove the older, dead leaves, which are slow to fall off and need to be removed by hand from time to time. 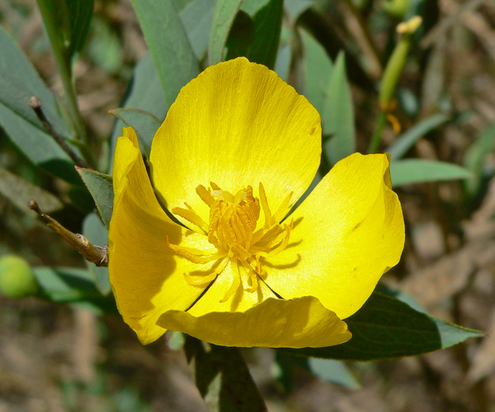 The bush poppy is also a “Fire Follower” (see the July 10, 2014 post for more about fire followers). Our bush poppy was touched on its right side by the June 1, 2014 fire, which ruined its otherwise perfect symmetry. Ironically, occasional fire is good for bush poppies — fires that sweep over ground where their seeds have fallen seem to enhance their ability to germinate. In fact, one tool that nursery personnel use to germinate bush poppy seeds is to plant them in flats, then put some leaf litter on top of the flats and set the litter on fire. (Note: You can usually enlarge photos by clicking on them.) Another variety, the Island Bush Poppy, (Dendromecon harfordii) is almost identical to D. rigida, but is reported to be somewhat more difficult to grow. Coming Attractions! During the past two years, the GNG staff has tried to add a wider selection of native wildflowers to the Garden. 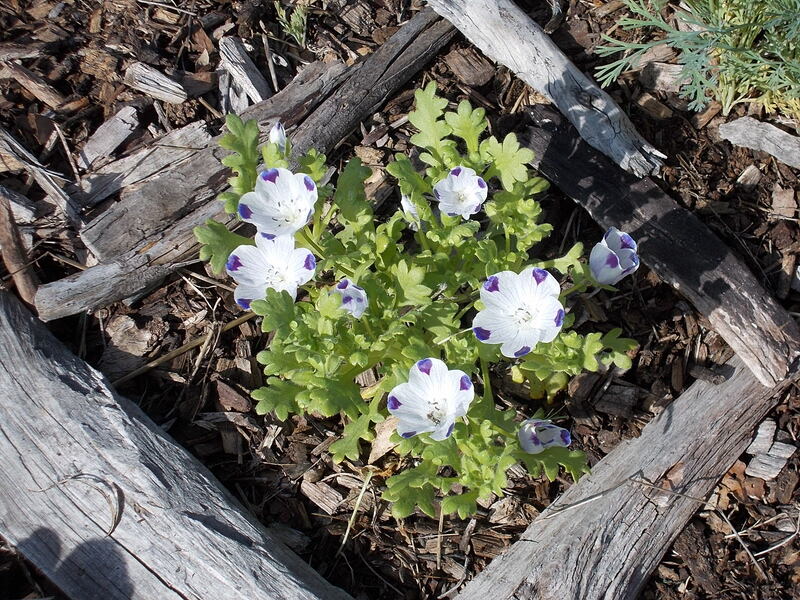 Among the additions are more lupine (Lupinus succulentus, at the right → ), as well as five-spot (Nemophila maculata, below ↓ at the left), baby blue eyes (Nemophila menziesii), goldfields (Lasthenia glabrata), and evening primrose (Oenothera hookeri). Planted last year and spreading on their own this year in considerable abundance are lots of farewell-to-spring (Clarkia amoena, below ↓ at the right) and fiddleneck (Amsinckia menziesii). The five-spot and the goldfields are already showing signs of blooming. 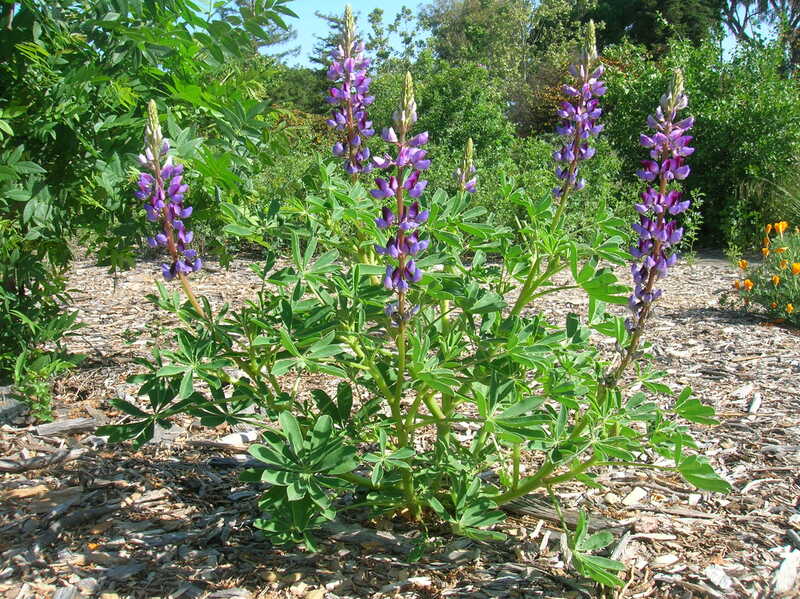 If the weather helps out (that is, with a little more rain), we should be able to enjoy an exciting display of native California wildflowers this Spring, primarily in March and April. Along, of course, with the California poppies, which are perennial show-stoppers. Don’t miss them, beginning now, thru March and April! Quote du Jour Look deep into nature, and then you will understand everything better. Lovely photos. Should be a good year for wildflowers at the garden!